This may have been one of the busiest weeks of the summer for me, but I managed to stop by a couple thrift stores and pawn shops in the middle of the week. And halfway through thrifting, I remembered that I hadn’t gotten my father a Father’s Day gift yet. So not only was I looking for things to collect and flip, but I was also looking for a cool gift for my dad in addition to the baseball tickets (Charlotte Knights) I plan on buying later in the weekend. Fortunately, I found exactly what I wanted to get him– at my final stop. 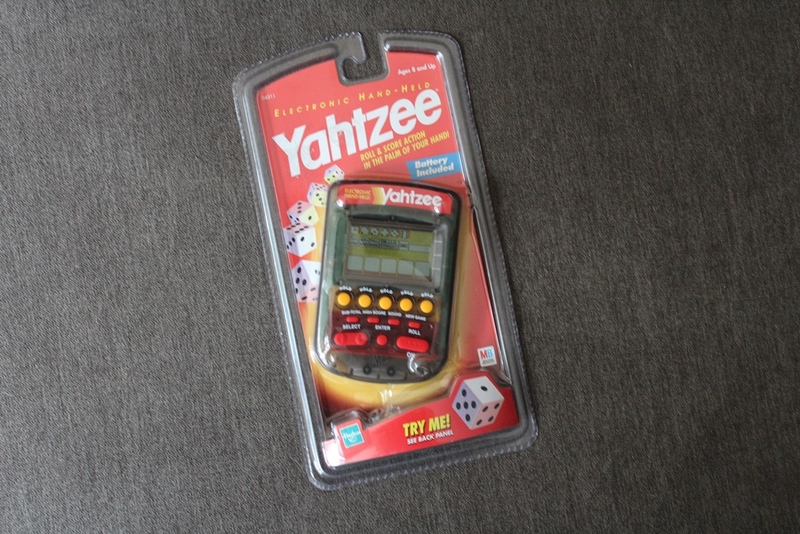 If you’ve kept up with my last few posts, I’ve mentioned that these Yahtzee games are always quick sellers. To me, I’d rather sell something that sells pretty well and quickly than something that sells for a lot and sits around my apartment for a long time. I’ll probably feel differently when I get a bigger place. But for now, I like to find these Yahtzee games, because I can sell them really quickly. The last one sold in two days for $10, which ended up being $6 profit. That isn’t much. But a lot of those easy things to sell really add up. Since this one is brand new, I’ll try to sell it for at least $15 (about $11 profit). For those unfamiliar with Jenga, the objective is to take turns pulling out pieces of the tower without making it topple over. 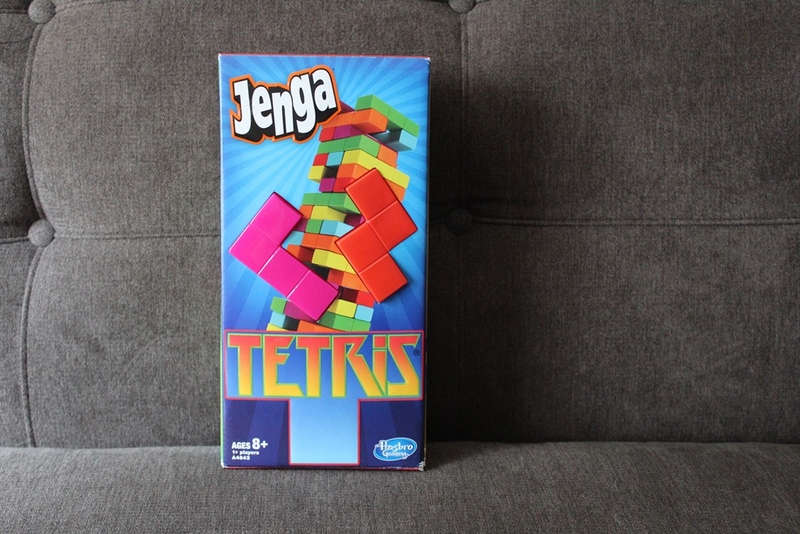 The twisted pieces of the Tetris edition adds a nice layer of strategy to an otherwise repetitive game. The only complaint that I have so far is that some of the pieces contain two blocks, a simple rectangle. These are not classic Tetris pieces as all Tetris blocks are tetrominoes, geometric shapes composed of four square blocks each. But I’ll get over it. The first thing I looked for on the back was how many pieces it contained– 47. So I dumped it all out on a nearby table and confirmed that the set was complete. This one is definitely going in my board game collection. Now I’ll be on the lookout even more for video game-themed board games. For those interested in owning it, Amazon sells these for $11. The Nintendo 64 console remains a dear part of my childhood. While I had many consoles before it, the Nintendo 64 was the first console that I remember going to the store personally to buy games for it– instead of buying used games cheaply from garage sales. 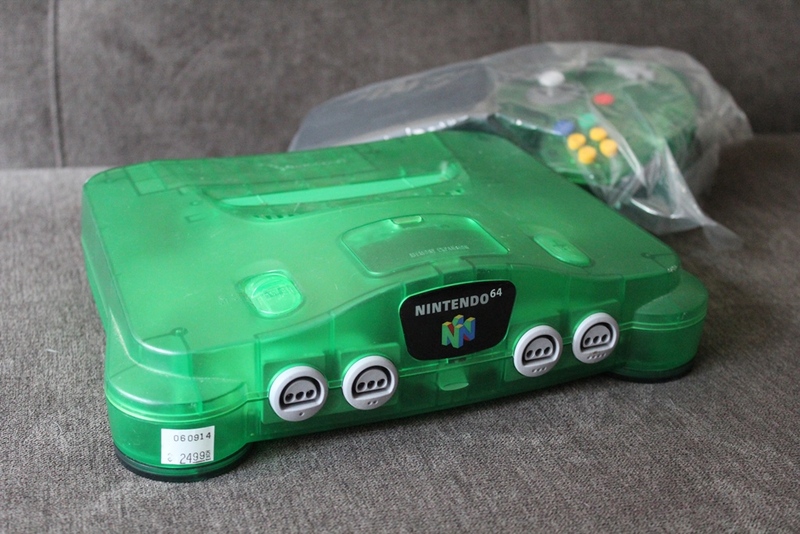 The Jungle Green colored console was first available with the Donkey Kong 64 bundle. Later Nintendo released the Funtastic Series used brightly colored, translucent plastic with six colors: Fire Orange, Grape Purple, Ice Blue, Jungle Green, Smoke Gray and Watermelon Red. I intend to collect them all. I already had the Jungle Green, but I couldn’t pass this one up for $25. So this will likely go in my trade pile. Currently, I have one standard N64 console, Ice Blue, Jungle Green, Smoke Gray and the Pikachu edition. This leaves me with four more to collect, including the gold edition. The Jungle Green console is valued at about $50. Finally, my Father’s Day gift. I found this at the final thrift store that I stopped at on my way home from work. I already planned to get my dad tickets to a Charlotte Knights baseball game, but I wanted to get something extra too. I typically go to two thrift stores in my area, both of which are about ten minutes away from my apartment. But since I have one weekday afternoon per week almost entirely free from work, I decided I’d try to try visiting a few different ones in the area and make an afternoon out of it. This one was about 25 minutes away from my apartment, but it had a ton of cool stuff. This was the first thing I spotted as I walked into the store. I saw the price tag and had to think it over. I walked around, sifting through stacks of DVD and CD cases looking for video games. Nothing. I checked the vinyl stack, but didn’t find anything that stood out to me. I later opened a sealed record (a common orchestrated collection) and popped it in the record player to make sure it worked. A used record could have messed up the record player. For all the audiophiles out there, I understand that Crosley is frequently known for poorer quality record players. But my experience with this particular model so far has been very positive. I already own this exact model, which is why I felt confident purchasing it. This model (CR66) plays records, CDs, AM/FM radio, cassette tapes and it has built-in auxiliary outlet. I’ll likely stop by my local record store before Father’s Day and pick up an extra record for my dad. He already owns a record player, but it’s very cheap and sounds terrible. This one is sold at Target stores, usually for $100 to $120. But they sometimes go on sale for as cheap as $80. To check out more of my yard sale and thrift store hauls, click right here. And as always, let me know what you think in the comment section. 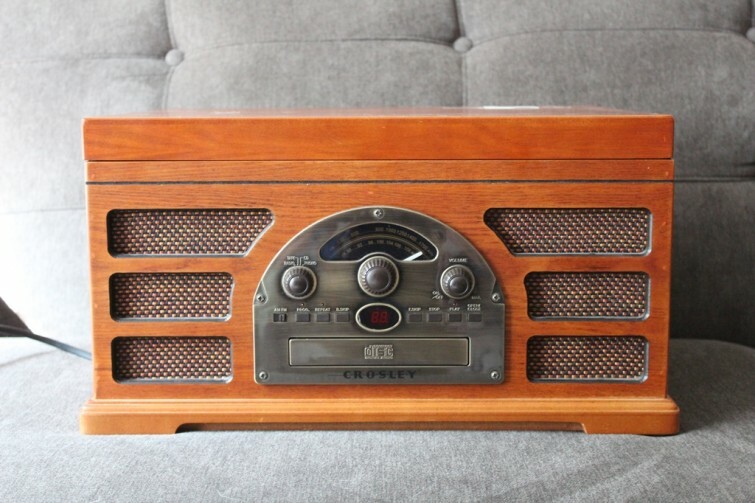 For you record collectors out there, what kind of record player do you collect? How do you feel about the quality of video game-based board games? What’s your favorite piece of electronic to flip?